With the winter chill all around, it’s once again the much awaited time of the year when we love to indulge ourselves in the festive holiday spirit. It’s the season of merry Christmas greetings now and Christmas icons are one of the best ways to pep up your festive wishes. The online world is flooded with a wide range of Christmas Icons that can be readily used on anything that spells Christmas- be it your holiday wall décor or the latest Christmas post or the Christmas cards. 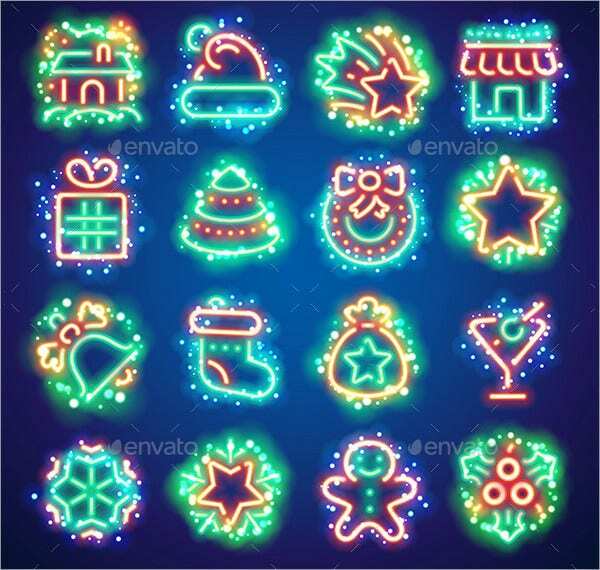 You have a brilliant set of as many as 25 Christmas icons here that you can use for a wide range of Christmas decorations, greeting cards, letters and so on. From the good-old Santa to the Christmas bell to the sledge to the snowflakes to the Christmas cake- the set here is bustling with a huge range of 54 Christmas icons that can be used for Christmas posts and decorations. If you are looking for a touch of humor with Christmas icons, these funny feet Christmas icons are sure to make your day. You can use them to pep up your Christmas card or the upcoming holiday post on your blog. You have a versatile range of Christmas icons here that will enable you to capture the merry holiday spirit at its best. Whether you want something regarding Santa or something regarding Christmas Party Icon– you have everything here. From the brightly decked up Christmas tree to the cute snowman to the signature red and white Santa hat to the holiday present – the Christmas icons set here includes all the things that spell Christmas. If you need varying ideas on how to draw Christmas trees, this template is just the thing you need with its wealth of unique sketches and doodles on Christmas trees. From the Christmas holly to the sweet snowman to Christmas Star Icon Template to the holiday presents to the Christmas candy- this icon set here has everything that speaks of the fun Christmas spirit. You have a wonderful set of Christmas icons here carrying the warmth of hand-drawn aura and they would be amazing for Christmas greetings, letters, and anything that wishes a merry holiday season. You have a magical Christmas icons set here carrying as many as 100 icons. The coolest bit is that you have the holiday icons in both colored and outline variations. If you are looking for Christmas icon outlines, this set would be all that you need- given its wealth of flat Christmas icon designs in fine outlines. They are fun and elegant. If you are looking for something edgy with your Christmas icons, this template here is sure to seal the deal with its dramatic metallic sheen -that would definitely render a new level to your Christmas Envelope and card. If you are looking for Christmas templates that can help you with signature Christmas icons, this template here would be the thing for you with its all the classic holiday season elements. You have a beautiful Christmas icons set here that speaks of “Merry Christmas” in various fun and merry fonts and all of them are accompanied by some signature Christmas icons. 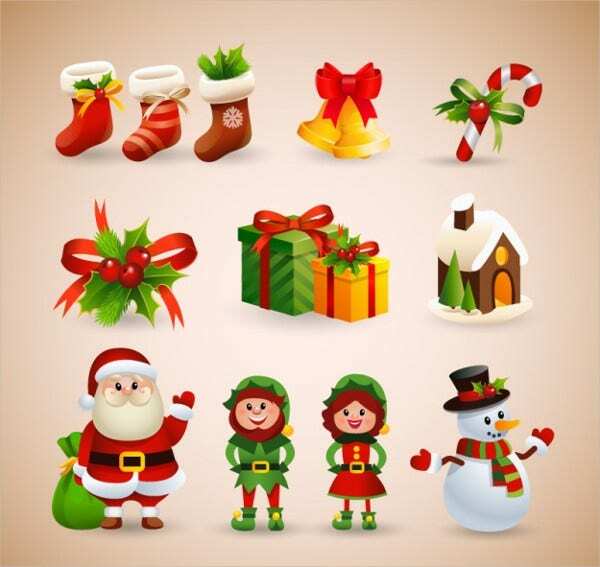 This Vector Christmas icons set is bustling with a versatile range of typical holiday icons- from the happy smiling Santa to the splendid Christmas tree- you have everything here and much more. If you are looking Christmas Cartoon Icons to be used on children’s Christmas cards and letters, this set here would be the thing for you with its wide range of all holiday icons in fun cartoon styles. Are you looking for Christmas icons to be used on your grand Christmas Post on the 24th of December or your holiday party invitations? Well, above you have some of the gorgeous Christmas icon sets in various styles and designs to choose from, as per your typical preferences and needs.